We had a trip to Kentucky, Tennessee, Virginia and Maryland late last year. At the end of the trip we had a 4 day stay in Washington DC and spent one day at the two National Air and Space Museum sites. I've finally managed to sort the photos out and will post the First World War aircraft shots up over the next day or so. Photography at the NASM is a little difficult and with a huge number of visitors getting shots can be fraught! Hopefully they will be of interest. Firstly the Royal Aircraft Factory F.E.8 reproduction - Cole Palen built this first known flyable reproduction of an F.E.8, which is believed to have first flown in 1970 at Old Rhinebeck with a Le Rhône 9C 80 hp rotary engine. It flew in the weekend air shows at Old Rhinebeck for a number of years, before being retired. urrently on loan to the National Air and Space Museum. Cole Palen was quite a character and showman as well as a talented vintage aircraft builder, etc. I live about 50 miles down river from Rhinebeck and try to get up there at least once per season. 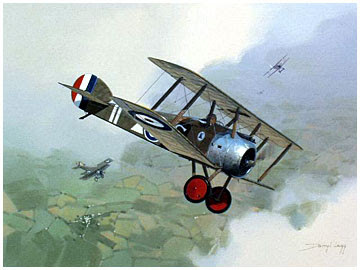 Cole was the heart and soul of the Aerodrome. Even though the current management runs it it the best they can and it's still an amazing place, it's not the same without Cole . It'll be quite a while before I can get back to the Smithsonian Lance. I live about 5000 miles away! One day I'll get there, next trip is to Ypres at the end of this month for a First World War battlefield tour. Depending on what I see/find I'll post up any relevant photos when I return.